Rich. Chocolatey. Divine. These melt-in-your-mouth orbs of chocolate are simple, quick, and addictive. With only three main ingredients required, this recipe allows the chocolate to truly be the star of this dessert. Because the chocolate is so prominent and pure, you'll want to make sure you don't skimp on the quality. I used Ghirardelli 60% Bittersweet Chips, which just so happen to be vegan (as is most chocolate of the dark or bittersweet variety), but try experimenting with other brands that you prefer. Start by melting the chocolate with oil (I used almond) and a little water in the microwave (see, so easy! 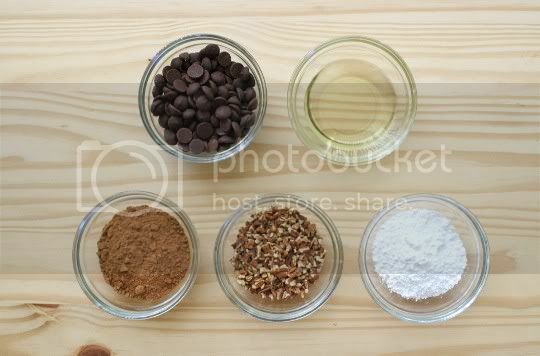 ); stir it together until the chocolate is completely melted and the mixture is completely smooth. This may take a few minutes of stirring, whisking, etc. Bring it to room temperature, then cover and refrigerate overnight. Making the truffles is pretty easy, but things can get very messy very fast if you don't have the appropriate tools (which I didn't). If you have a melon baller, it may be the best thing you can use for this recipe. And if you don't but plan on making more things like this in the future, buy one! Otherwise, you can use a spoon to gather walnut-sized balls of the chocolate...but then, you'll have to roll them in your hands to form a ball, and that's when things get messy. I think this may also have something to do with the recipe itself. I'm not totally sure the water in the recipe is necessary; I think it makes the chocolate softer and not as stiff as it should be for the expected truffle texture. So try omitting the water and only combining the chocolate and oil. Anyway, once you have a ball formed, roll it in cocoa powder until it's completely coated. 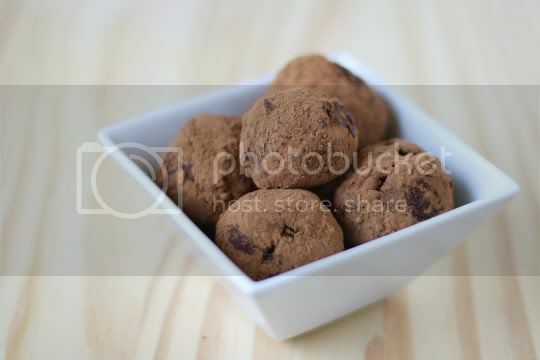 Set on a plate, and form the rest of the truffles in the same manner. You'll notice I included powdered sugar and chopped nuts in the ingredients photo; however, using these to roll the truffles in proved to be ineffective. The powdered sugar got all wet and weird, and the nuts were too big. I think the nuts could definitely work, but they have to be ground much, much finer. Shredded coconut might also work well. And they were delicious! I don't know if the flavors needed to develop, or if the texture was just better because they had been refrigerated, but they were wonderful and I couldn't stop eating them. What's crazy is that I typically don't even like dark chocolate! But this was sweet in a fruity sort of way, and actually tasted light and fresh. The texture was smooth and velvety, and they really were melt-in-your-mouth in a decadent, divine way. Whew, I'm sure glad I didn't throw them out! Make again? Yes, with some recipe adjustments. Omit the water, try a different oil, maybe even add a little soy milk for creaminess. You're not supposed to add water to chocolate when melting.. it will seize! In fact, you're supposed to avoid getting water in the chocolate at all, to prevent seizing. True, but the oil smooths it out again. And I'm sure the microwave melting process probably helped that along. Try the recipe, you'll see there's no seizing involved! I think Ghirardelli chocolate chips in general have a fruit-y taste to them. You can do the same thing with Coconut Cream instead of the oil-- it can't be coconut milk, it doesn't have a high enough fat content. Also, if you're rolling them by hand, using disposable gloves makes it much easier to do, and less messy! Ghiradelli 60% Cacao Bittersweet Chocolate Chips have milk fat in them. Sorry, I was looking up a recipe for my dairy-allergic husband and I have explored this chocolate in the past. Ah! Thanks for the info, will remember that for sure!